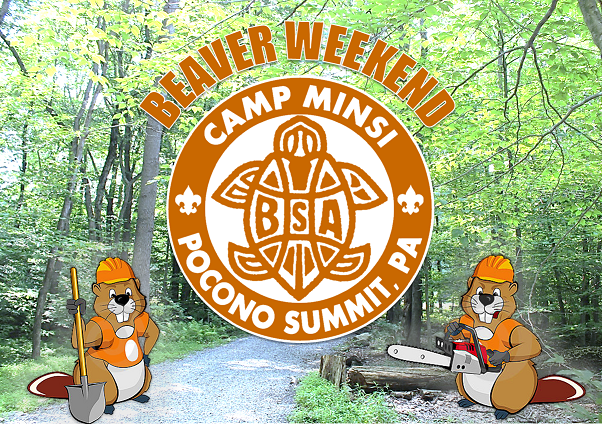 Beaver Weekend is a unique opportunity for service, fellowship, recreation, and camping at Camp Minsi! Take the opportunity to bring your unit to Camp Minsi in order to check out the facilities, meet the staff, participate in programs, and give back to Scouting by working on service projects to help get camp ready for the summer. This event is completely FREE! Camp Minsi will provide your unit with a site, tents, and cots. A complimentary lunch will be provided on Saturday for all who are participating in the day's service projects. In addition to the volunteer work, Scouts will have an opportunity to take advantage of several open program areas on Saturday afternoon to meet staff and get a feel for the camp experience. Your unit can come and actually camp in the site that you will be staying in for your week at summer camp. If your unit decides not to make a weekend out of the event, you're invited to come up just for the day on Saturday to participate in all the fellowship events, service projects, and other festivities. On Saturday evening there will be a spaghetti dinner fundraiser in the dining hall to benefit Venturing Crew 940, a group that provides service and leadership to Camp Minsi. Cost per person is $7. If interested, please register your unit online as soon as possible. More information, including a list of the specific service projects, will be made available at campminsi.org closer to the event date.